Workers at Apple partner Foxconn have alleged that their employer transferred underage employees to other departments or did not schedule them to work overtime in order to avoid discovery during recent inspections by the Fair Labor Association, according to one non-governmental organization. Students & Scholars Against Corporate Misbehavior (SACOM) project officer Debby Sze Wan Chan relayed the claims in a recent interview with AppleInsider. SACOM is a Hong Kong-based NGO that was formed in 2005 and has been researching labor rights violations in the electronics industry since 2007. Chan said she had heard from two Foxconn workers in Zhenghou last week that the manufacturer was "prepared for the inspection" by the Fair Labor Association that had been commissioned by Apple and began last week. "All underage workers, between 16-17 years old, were not assigned any overtime work and some of them were even sent to other departments," Chan reported the workers as having said. Another Foxconn worker in Chengdu said she had been allowed three breaks a day recently because of the audit, whereas she is accustomed to only receiving one break a day. Apple's supplier code of conduct allows for workers between 16 and 18 years old if they are legally allowed to work, but it requires special protections for those workers that limit how much and what kinds of work they are allowed to perform. FLA president Auret van Heerden initially told reporters last week that Foxconn's facilities were "first class," though he did add that there are "tons of issues" that need resolving. He also revealed in an interview with Nightline that Apple had paid $250,000 to join the FLA and was picking up the bill for the audits. van Heerden did say in that interview that he expected Foxconn to put on a show. The FLA plans to conduct "bottom up interviews" as part of its audit, as noted by TUAW. According to SACOM, some Foxconn workers feel that Apple does not care about them because they believe the company's representatives have seen labor violations during their visits and have elected not to do anything. Chan recounted instances where she had told workers about a letter that Apple CEO Tim Cook allegedly wrote declaring that the company cares about "every worker in [its] supply chain." "The workers just feedback that they don't feel this [care]," she said. 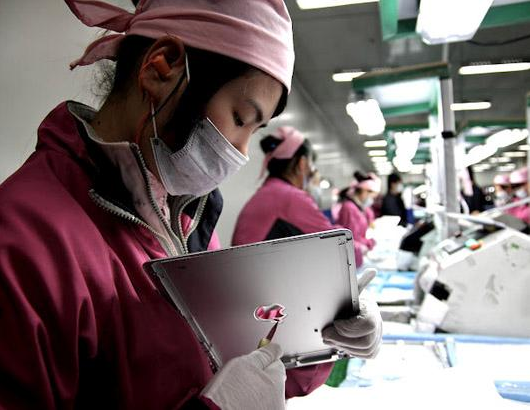 "Most of the time, the workers are aware of the presence of Apple's representatives inside the factories. It is not the problem that Apple doesn't know the real problems at their suppliers. They know, but it is only because they do not care," she added. For her part, Chan said she hopes that Cook will work to improve working conditions among suppliers, but she also expressed doubts whether he has "any commitments to do so." SACOM has drafted a petition calling for Apple to "end the use of student workers; provide a living wage for all the workers so they do not have to work excessive overtime hours; conduct labour rights training for workers, including training on occupational health and safety; facilitate the formation of a genuine trade union through democratic election; and compensate the victims if there is non-compliance with the Apple code of conduct." Chan said she had yet to receive a reply from Apple after more than two years of trying to contact the company. She even visited Apple's Cupertino, Calif., headquarters in an attempt to deliver reports, documentaries and petition cards to the company, but, according to her, the receptionist refused to receive SACOM's materials. "Finally, a security guard tried to disperse us and he promised that he would hand the materials to someone in charge, but I haven't heard from them since then," she said. SACOM protesters attempted to deliver Apple a petition from Sum of Us on Tuesday at the Apple Store in Hong Kong, but no one from the company would accept it. Apple did not respond to requests for comment from AppleInsider. When asked whether recent reports from The New York Times and CNN on Apple's supply chain are accurate, Chan said their findings were "quite similar" to her organization's own research..
"The workers always tell us they resemble machines," she said of her trips to the Foxconn's Chengdu factory. "Their regular day at Foxconn is waking up, queuing up for baths and work, work and go back to the dormitory and sleep. They do not have a social life and they are doing the same monotonous task in the factory for thousands of times a day. If they are not efficient enough or they make some mistakes, they will be yelled at by their supervisor or punished." Chan took things a step further and said that mainstream media outlets have left out an important issue that should be under the spotlight: involuntary labor and the use of student workers. According to her, local Chinese government departments provide recruitment assistance for Foxconn and sometimes require that schools send their students to the manufacturer for internships even if their studies are in unrelated disciplines. She also said that a recent raise from Foxconn was not enough to provide livable wages to its workers. The company announced last week that it was raising worker pay by between 16 and 25 percent. Other manufacturers, including Flextronics, Huawei and Wintek have also increased their basic salaries for their workers. "In Zhengzhou, the basic salary of new workers is CNY 1350 ($214)," Chan said. "And there is a deduction of CNY 150 ($24) for the dorm. If a worker eats inside the factory, there is another CNY 200-300 ($32-48) to pay. It is far from the living wage standard. Without overtime premiums, a worker can hardly support his/herself." One Foxconn VP appeared to put the onus on Apple in a recent interview by saying that the company would welcome demands from its client to double worker pay. Chan did admit that many factory jobs are better than opportunities in workers' hometowns, but she pointed out that the fact that the opportunities are better than others should not be an excuse to violate workers' basic labor rights. It should also be noted that other brands have a responsibility to ensure fair conditions in their supply chains. As the biggest IT manufacturer in the world, Foxconn provides services for a number of Apple's competitors, including HP, Dell, Nokia, Samsung and Sony. Chan said working conditions on production lines for most companies at Foxconn are generally "quite similar," though she did note that interviewees have indicated that Finnish handset maker Nokia does try to guarantee at least one day a week off for Foxconn workers assembling its products. Other production lines might only allow one day off every two weeks, Chan added. When asked what individual consumers should do to act on concerns about working conditions in the electronics industry, Chan urged buyers to put pressure on companies, including Apple. "I think the pressure from consumers is definitely the most important incentive for Apple to reform because Apple, like any other corporation, aims to maximize the profits and minimize the responsibility. If there is no pressure from consumers then Apple does not need to care about criticism from the public." "Apple has its code of conduct, but that is merely a piece of paper without a mechanism to enforce those standards," she continued. "When we demand that Apple should fix the problem, it's not just because Apple is under the spotlight, but it's also because we hope to hold Apple accountable because the company has publicly pledged lots of things, like that they will ensure decent working conditions at its suppliers." To its credit, Apple has made some moves toward greater transparency with its supply chain as it looks to curb worker rights abuses and environmental violations in addition to its decision to join the FLA. One well-known Chinese environmental activist revealed earlier this week that Apple had agreed to allow his organization to audit two of its suppliers. Apple also released a public list of its suppliers last month for the first time. In addition, the company allowed Nightline an unprecedented look at iPhone and iPad production lines.